Dreamlike trophies - Genuine Jaybird feathers are laminated in the haft of this fantastic pocket knife and make every single piece unique. - Not only hunters and collectors, but also sport fishers and outdoor fans are excited about this attractive accessory. - Its sophisticated blade arresting mechanism is the development of an aeronautic engineer from the Auvergne. - An indeed noble and through and through handcrafted knife of the French Laguiole cutlery manufacturer Claude Dozorme in Thiers. - Forged from highest quality steel and speckless shiny polished. - For best cutting comfort. - The delivery in a fancy gift box makes it an ideal gift. 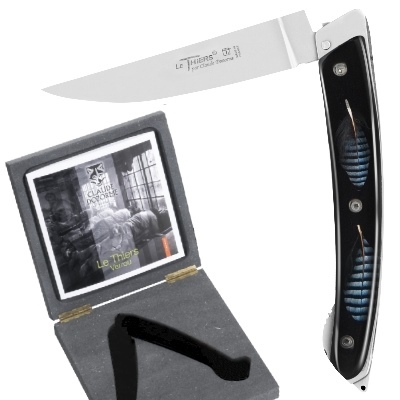 - Exclusive Thiers Pocket Knife in Giftbox, with blade arrester and laminated genuine Jaybird feathers, Dimensions: haft l 13.5 cm, blade 10 cm.